Desert in bloom at sunset, Joshua Tree NP, California. I bracketed three exposures, two stops apart, and blended them with Lightroom’s HDR Merge. 33mm, f/16, ISO 100. 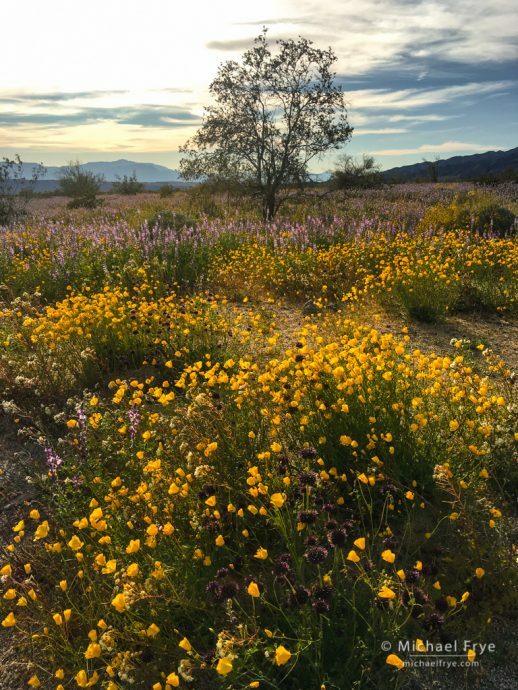 Last week Claudia and I visited family in Southern California, and, while we were in the neighborhood, detoured to some early-season wildflower spots: Walker Canyon, Anza-Borrego Desert State Park, and Joshua Tree National Park. 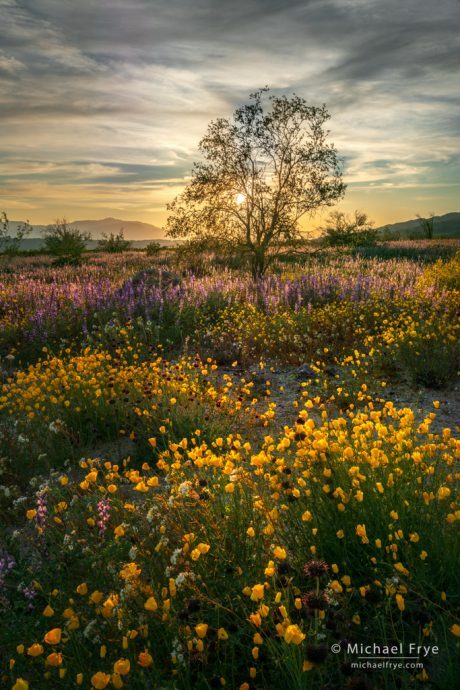 In past years I’ve photographed beautiful wildflower displays in semi-desert areas like Antelope Valley and the Carrizo Plain, but never in true, low-desert habitats like Anza-Borrego and Joshua Tree. It was amazing to see these normally-dry places blooming. The hills in Anza-Borrego were so green that in the right light, if you squinted (and used your imagination), it looked a bit like Ireland. 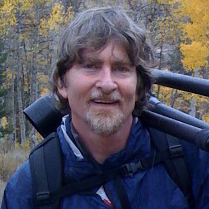 The birds were in a springtime mood as well; we walked up a wash one afternoon accompanied by a symphony of bird song. We spent another afternoon in Joshua Tree National Park, where we saw the typical California wildflower mix of poppies and lupines. Except these weren’t the typical, orange, California poppies (Eschscholzia californica), but rather yellow desert poppies (Eschscholzia glyptosperma). 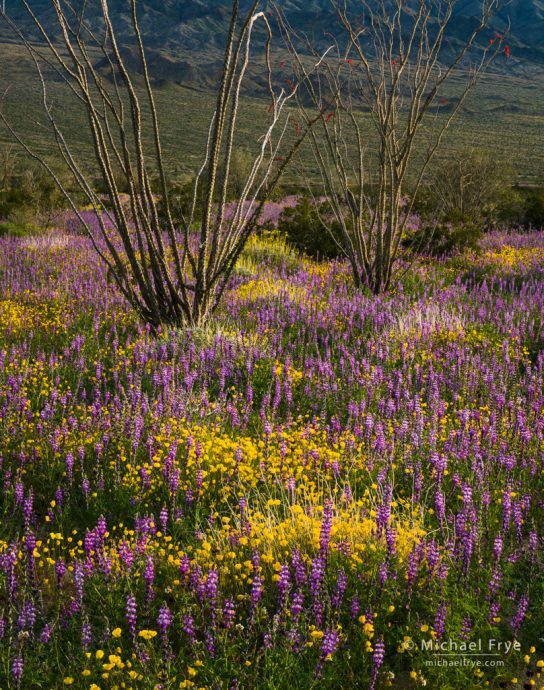 And the lupines were also a different species, the desert lupine (Lupinus sparsiflorus). And instead of growing next to live oaks the flowers were growing alongside brittlebush, ocotillos, and palo verde trees. 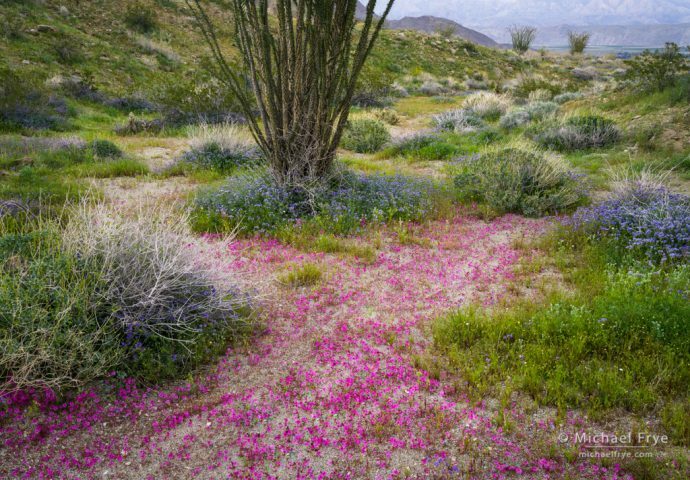 The dry, austere desert was transformed – briefly – into a flower garden. In Joshua Tree that afternoon we photographed smaller scenes and patterns of flowers while the sun was still fairly high overhead, but I kept my eye out for wider views that might work when the light got more interesting. Some high clouds were floating up from the south, increasing the odds of a good sunset. We scouted by car and on foot. Claudia would drive so I could look, and if I spotted something interesting I would ask her to stop, and walk back to check out what I had seen. If I found a spot I might want to return to I would snap a picture with my phone, and, if I thought the location might be hard to find again, mark the location with my GPS app. We found a beautiful spot with a mixture of poppies, lupines, brittlebush, and ocotillos, and photographed around this area as the sun dropped lower and the light got more interesting. But as pretty as this spot was, I couldn’t find a wide view to the west that I liked – a view that might work at sunset. iPhone snap made while scouting for locations, 6:15 p.m. When we returned to this location just before sunset I set up almost the exact same composition with my big camera. I thought the sun might set behind the tree from this angle, and it did. I was going to wait until the sun slid behind a branch of the tree, to block some of the light and minimize lens flare. But then I realized that if the sun moved behind a branch it would cast shadows on the foreground flowers, so I didn’t wait, and started bracketing exposures even with the sun shining on the lens. Some thin clouds dimmed the light a bit, so that helped, and the minimal amounts of flare that did creep into the photo were easy to clean up. You can see the final image at the top of this post. 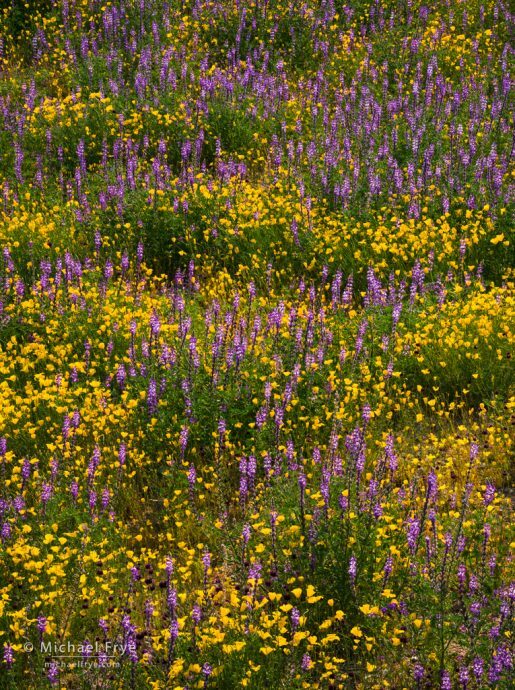 We might get to photograph more flowers this spring, but probably in different habitats – rolling, grasslands with scattered oaks instead of cactus-studded deserts. I really enjoyed seeing the desert in bloom; it was a great way to start the spring and the beginning of the wildflower season. 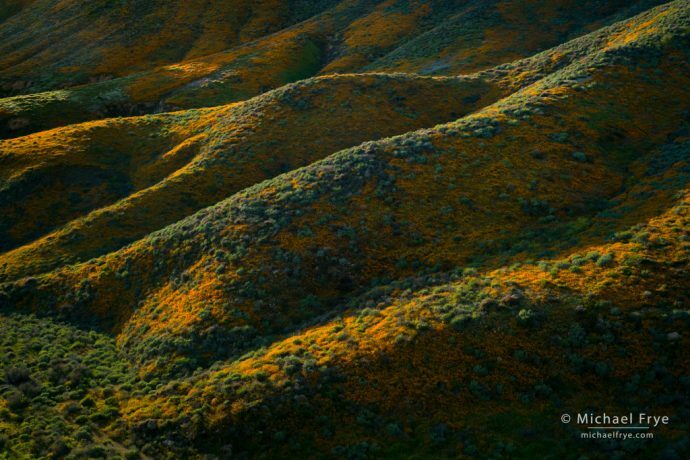 Poppy-covered hills, Walker Canyon, California. 50mm, 1/15th of a second at f/11, ISO 100, polarizer. 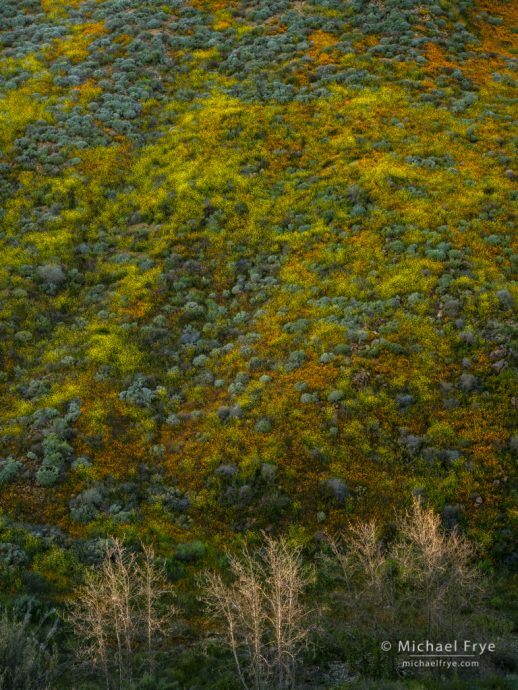 Poppies, mustard, and sycamores, Walker Canyon, California. 50mm, 1/6th of a second at f/11, ISO 100, polarizer. Desert garden, Anza-Borrego Desert SP, California. 70mm, 1/20th of a second at f/16, ISO 50, polarizer, focus-stacked. 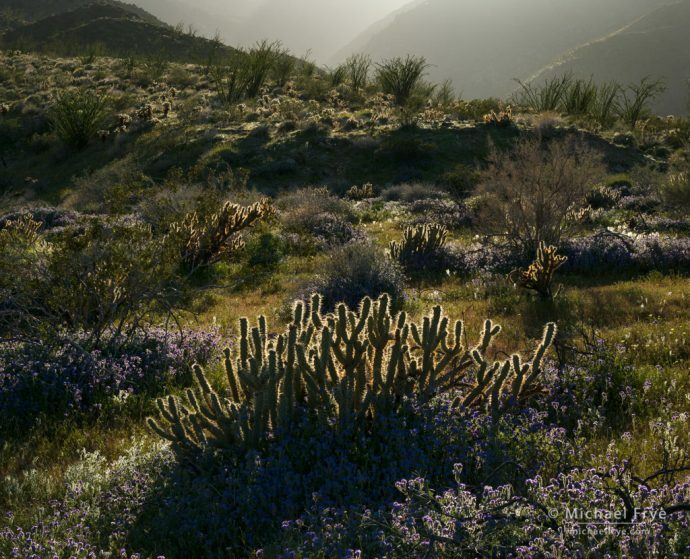 Desert wash in spring, Anza-Borrego Desert SP, California. 33mm, 4 seconds at f/16, ISO 100. 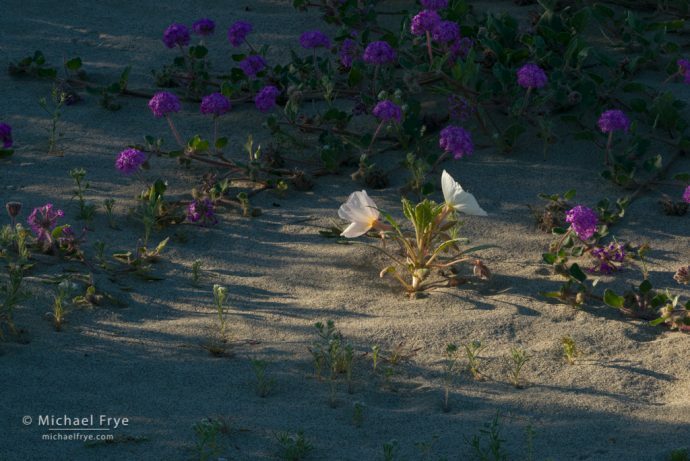 Primrose and verbena, Anza-Borrego Desert SP, California. 200mm, 1/15th of a second at f/16, ISO 100, polarizer, focus-stacked. Poppies and lupines, Joshua Tree NP, California. 142mm, 1/30th of a second at f/16, ISO 100, polarizer, focus-stacked. Ocotillos with desert poppies and lupines, Joshua Tree NP, California. 90mm, 1/20th of a second at f/16, ISO 100, polarizer, focus-stacked. Exquisite post Michael … absolutely gorgeous shots!!!! Thanks for sharing. If you like wildflowers (I know you do), you should visit Texas in late March or early April to photograph the bluebonnets. They’re very picturesque. Thanks for the suggestion Gabor – maybe someday. Oh my, thank you for sharing these. You’re welcome Doug – thanks! All very exquisite photos Michael. Thanks so much for sharing. Excellent photographs, as usual, Michael! My favorite is Desert wash in spring, Anza-Borrego. Very well-composed! Thanks Arup! A number of people seem to like that image. 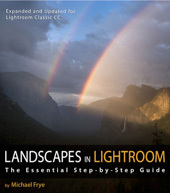 Wow, just a spectacular show and stunning images! These are all spectacular, Michael, but I really like the Desert Wash in Spring. Something about those blooms creating the leading lines! Thanks Vivienne! I found that spot in the afternoon, while it was in the sun. I knew it would work better in shade, but circled around the patch of flowers in the wash and looked at it from every angle, trying to find a composition that would work. But I didn’t really see the composition shown here until later, when the scene was actually in the shade. Sometimes it’s hard to visualize how something will look in different light. The sky is just barely out of the frame near the top in the middle, and I didn’t want to include any of that sky, since it would just be a bright distraction. So I put the tripod as high as possible, above my head, in order to put as much space as possible between the two distant ocotillos and the top of the frame.